but they ain't gonna be in the kitchen. Hen House and tending to her new Nest! Now don't lay an egg and pitch a fit. it ain't that far away whether we like it or not! Y'all be good now, ya hear! We'll see ya in 2019! 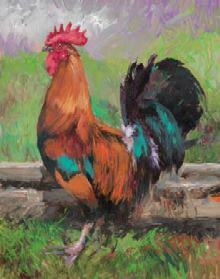 keep yer feathers from gittin' all messed up! apron with yer next pie! If you wanna order an apron, and they make the cutest darn gifts, you can pick BLACK, RED, WHITE or ANIMAL PRINT. (Yes, I know my white is yellow, but if I made that white, you couldn't see it, haha!) The prints will vary on the red and white depending on what Miss Donna has in stock, but they'll always be a combo of the Diva's signature colors. That sassy animal print is always in-stock and black is black. 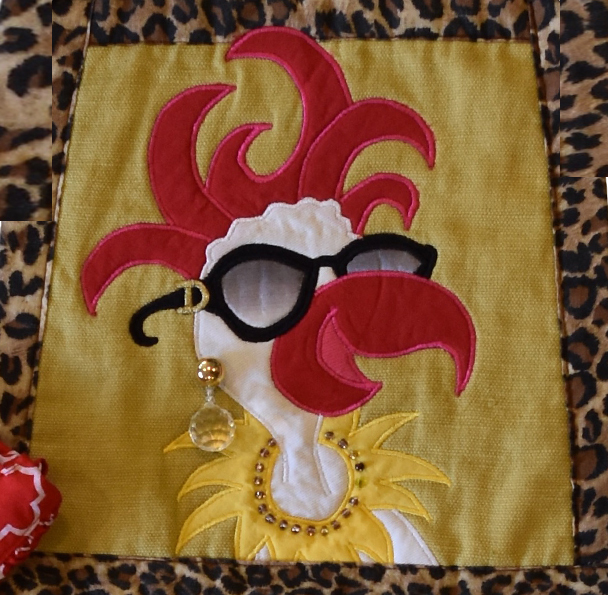 The earring bling on the Diva is too darn cute, right! We all need our jewels! Just tell the Diva when you call to git yer pie order in that you need an apron or two and she'll get it tended to. If you wanna see what else Miss Donna is whippin' up in her coop go check her out on her WEBSITE, or your favorite social: FACEBOOK, INSTAGRAM, or TWITTER! She's also got an ETSY shop! And y'all, she does custom stuff too, so give her a shout on Facebook for that info. 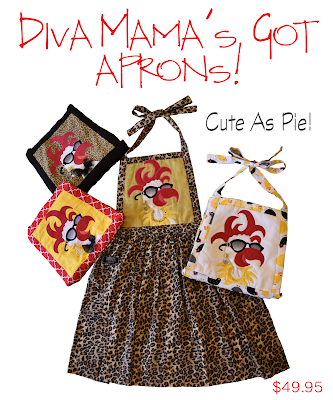 for a special Pie/Apron DEAL comin' up soon! all planned out, so y'all come back now, ya here! are cookin' in the coop! price increase listed in the sidebar. Diva has been forced to raise her prices! and if'n you need giftwrap! DON'T BE LATE CUZ THE DIVA CAN'T WAIT! Have your pie delivered straight to yer door for a small delivery charge of $10. Any day but cookin' day and most Charlotte locations! 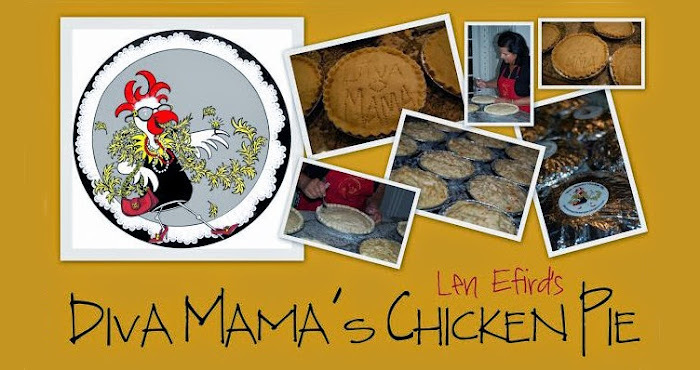 You can fetch yer pie @ Diva Mama's Hen House Freezer (in the garage y'all) for free! That's right, the Diva ain't gonna charge you a thing to come fetch yer pie! Pick yer most convenient location and include it with your pie order! by this schedule. We'll keep ya updated on that. 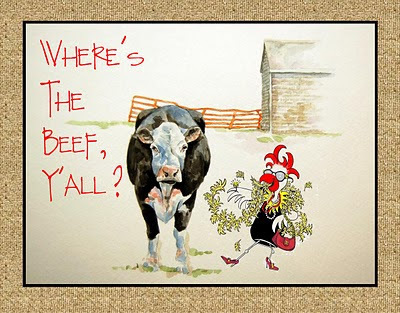 The Diva and Miss Bessie are takin' some good ol' Angus beef and simmerin' it for hours in beef broth, shreddin' and addin' some chunky veggies in a creamy beef sauce with that good ol' double crust! Y'all serve this up with some good ol' mashed taters or rice with those LeSeuer peas we love so much and that's called comfort food! Don't forget we always get one last blast'a winter and this'll gitcha through it! Remember, they freeze great so have one ready to help thaw that last blast! so it's first come, first served! Here's some news y'all can use! The first update is about the Gift Wrappin' Policy...So here's the deal. If you want your pie wrapped up in that purty cellophane paper, it's gonna set ya back $3.00 per pie. (Now, a'course there's no charge for ziplocks) If you want yer baby pies wrapped...that's harder and a little tricky, so if you want them individually wrapped, that's $1 for up to two pies per package. More than 2 babies wrapped together will be jest like a big pie, $3. Now, we're not raisin' the price of the pies, but as much as she hates it, them gas prices have driven the Diva Mama to chargin' for delivery. Some things we jest can't control. Home/Office delivery is gonna run $5, but there are FREE pick-up/delivery options listed, so CLICK HERE and we hope one of these works jest fine fer y'all. 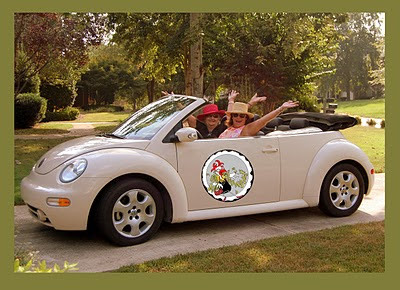 So when y'all'r placin' yer pie order, don't forget to tell us how and where ya wanna git it. If none of the options work fer ya, Diva Mama's a pushover and you can call her up and work out a better plan that works for both of ya. in the kitchen so y'all call and order yer pies ASAP! Oh yeah... and feel free to share this link with ya friends! I guess you could say Mama & her kitten! on a lil' road trip! "Y'all buckle up now ya hear!" The View from Hen House! Holler at me! I love me some Peeps! Thanks, y'all! Ya make cookin' FUN! when ya think of somethin' good to eat! Now Mama Bonnie lived 'til she was 97 years young, and she ate a bunch of these pies and this salad! Mix together 'til smooth, and "dress" the salad with it. Chill awhile and serve with the pie and the peas! A perfect combo for your palate! What? Why sure, Y'all can "Diva" up this recipe by addin' all kiinds of exotic fruit, like blueberries and raspberries and such, but the plain ole' Mama Bonnie recipe calls for the basics..... stuff she always had on hand....just in case company dropped by at supper time! Exotic for her was addin' those mini-marshmellows every now and then! Y'all ENJOY now, ya here!? BabyBee's been cookin' in LA! After ya have a listen, click the back button and git back here ta order ya pies! To place an order is as EASY AS PIE! Please place your order, with delivery/pick-up location and time as far in advance as possible if you want 'em when you want 'em! Check the Pie Delivery Page for the schedule and take the DIVA's cell number with ya in case you get a flat tire, cuz the DIVA can't wait if you're late! She's got places to go and people to shake! Don't forget to let us know how you want dim pies...ziplocked or giftwrapped! GIFT WRAP ($3) is available for any occasion... Check the Pie Delivery page for all the ways you can fetch yer pie and don't forget to include that with yer order! 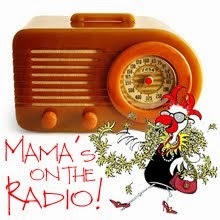 Mama Diva's Chicken Pie recipe was passed along to me by my mama, "Mama Kitty", so I guess that makes me a kitten y'all! In Union, SC, vittles didn't get no better than this, so how can I keep it to m'self? I'm proud to share the tradition of Mama Kitty's pie y'all and just wanted y'all to know where the credit was due! Git Outta Miss Len's Kitchen! Here's how Mama sez to bake 'em! Bake at 400 degrees, uncovered. Now, if your pie's frozen (you forgot to put it in the fridge before you headed to Neiman's this mornin'), you'll need to bake it a smidge longer....say an hour. If you're all organized with the check-offy kind of to-do lists, then your pie has been thawed and you only need about 40-45 minutes. You'll want to leave the crust's edge covered in foil to prevent burning. YUM, YUM Eat 'em UP! Oh Yeah! I almost forgot! Mama suggests some of them "French peas" in the silver can to serve up with her pies, and a good, old fashioned Waldorf Salad seals the deal! Lil' bitty Foil Tip from Diva Mama! Before you unwrap your pie, take a knife and cut away the center of your foil. This'll leave the foil wrapped around the edges and expose only the top of the pie. Then, the last 10 minutes or so, ditch the foil so that those edges brown. Girl, that was so easy! It's time to order some pies! Some of Diva Mama's favorite sites!